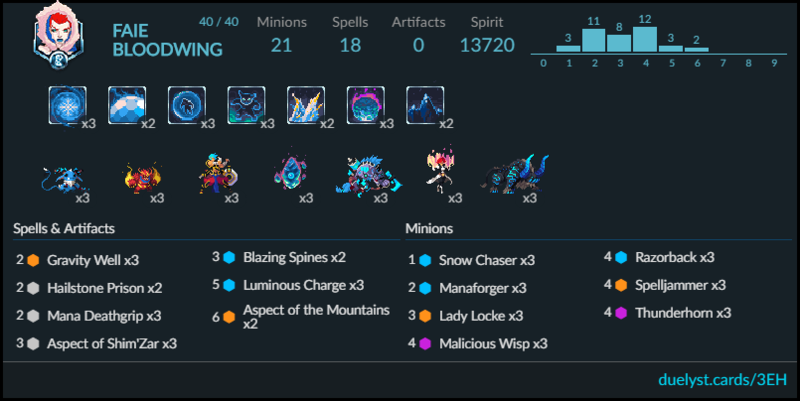 hi, my name is snowshot, a veteran vanar player (since beta) and an absolute researcher of the frosty faction, most of my decks are unortodox but well performing. i’ll add a guide on the forums and update here. locke + luminous/blazing/ chasers (+ razorback – if needed). dmg output from 10 to 25+ dmg. Lady Locke and walls are just the most satisfying finishers, and there’s a decent amount of room around these so that plenty of decks can be tried around this concept. Try it once and never look behind. Favorite Vanar deck, no competition. High-skill tempo orientated Midrange deck using Jax Truesight + Razorback as a finisher. I’m going to preface this by saying that this is not an easy deck to play. So, if you are a magmar main, you might as well just click on another deck. That said, if you want an unconventional, but strong deck then this is the deck for you.